One of the most powerful results of the global shift to online business is that anyone can have platform to deliver their ideas to the masses. Unfortunately, most people don’t know how to use that platform effectively. Online businesses have been hitting customers with lazy, disorganized walls of text for years. Customers have gotten so sick of looking at sites like this that they usually just abandon the website to go find one that serves their needs more clearly. This is what makes up the bounce rates for your site: the number of people who bail out vs. the total number of total people who visited your site. If you can better engage your visitors, your bounce rate will decrease, and your number of conversions will increase. The key to this engagement is all in your writing. If you are saying the right things to the right people, you get purchases, but many businesses pollute their message with unnecessary junk that costs them in revenues. Which did you best connect with? Most likely, the second message. Why? The first message is all about talking at you, and telling you how great some brand is. On the other hand, the second message speaks to the reader, and connects with things that matter to them: 1. Turnaround time on cleaning, 2. Affordable pricing, and 3. Convenient location. So who do you want to buy from, a cleaner who thinks they’re the greatest thing since the invention of the tumble-dryer, or a cleaner who knows that you want fast, affordable, and close, and are ready to deliver on those promises? Think about what motivates your specific customers, and focus on giving it to them, not asking that they buy into how great you are, because no matter how awesome you are, your business will never be as important to your customers as it is to you. Instead, communicate the ways your product/service/organization can benefit their lives in tangible, specific ways. This one goes hand-in-hand with #1. Once you have figured out what your customers want, don’t dilute your message with unnecessary details. If you can tell your potential customers that you have software that makes their business 30% more productive, they don’t need to know how it does this, and frankly, they don’t care yet. Just let them be tantalized by that juicy 30% benefit you’re offering them. Secondly, take that savory nugget of copywriting goodness, and put it right at the top of your homepage. People have incredibly short attention spans, and a majority of people won’t make it halfway down your page. So if you have a service or product that that can benefit their lives, DON’T WAIT! Check out this graph from Chartbeat that describes how quickly visitors lose interest. It makes sense to lock them in with your best messaging right from the beginning. This is a histogram showing how far people scroll through Slate article pages. Each bar represents the share of people who stopped scrolling at a particular spot in the article. (An article is assumed to be around 2000 pixels long; if the top of your browser window gets to the 2000-pixel mark, you’re counted as scrolling 100 percent through the article. The X axis goes to 120 percent because on most pages, there’s usually stuff below the 2000-pixel mark, like the comments section.) This graph only includes people who spent any time engaging with the page at all–users who “bounced” from the page immediately after landing on it are not represented. The graph shows that many Slate readers do not scroll at all. That’s the spike at the 0 percent mark, representing about 5 percent of readers. 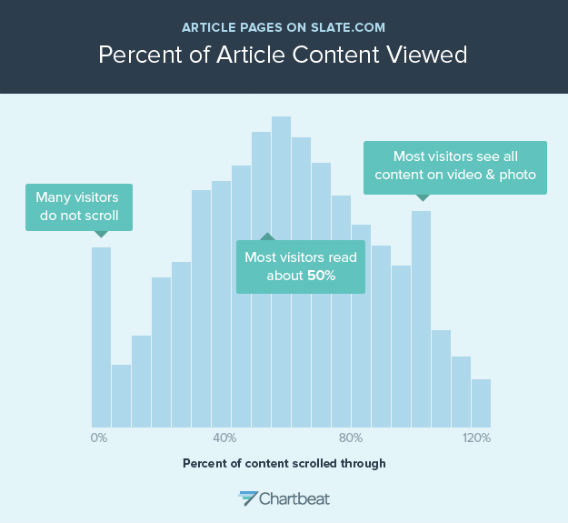 Most visitors scroll about halfway through a typical Slate story. The spike near the end is an anomaly caused by pages containing photos and videos — on those pages, people scroll through the whole page. One of the most important things the graph above shows is that, even when they scroll past text, visitors will stop for photos and videos. Knowing this, it makes sense to attach your most important messaging to the part of the page most likely to be noticed – pictures. But it’s important to be just as picky with your imagery as you are with messaging. People are so used to being hit with bright/flashy/”eye-catching” imagery that we’ve developed ad-blindness, a subliminal filter where our brains help us skip over spammy visual garbage. It’s extremely important to pick high-quality imagery that supports your writing and invites your viewer’s eye. A common technique used here is to pair a message that promises a positive experience with an image of a person having a similar experience. The reason this works so well is that umans are extraordinarily empathetic. When we see others feeling a certain way, we subconsciously match their emotions. This, once again, is the key to powerful messaging: connecting with how your customers feel. Now that you’re well armed with some purchaser psychology, go take a look at your website, but first, put yourself in your customers’ shoes, imagining you have the same desires, pains and motivations they do, and see if your site immediately speaks directly to you. Lance Dockins is a website security, custom development, website performance expert, and family man based in Oklahoma City. While serving as founder of VRAZER, LLC, UnHack.Us, and WP Boost he has had the fortune of working for a number of reputable clients including MasterCard, AT&T, Waffle House, Focus on the Family, and Life Church.